The legal history of cannabis in the United States began with state-level prohibition in the early 20th century, with the first major federal limitations occurring in 1937. Starting with Oregon in 1973, individual states began to liberalize cannabis laws through decriminalization. In 1996, California became the first state to legalize medical cannabis, sparking a trend that spread to a majority of states by 2016. In 2012, Colorado and Washington became the first states to legalize cannabis for recreational use. 1990: The Solomon–Lautenberg amendment is enacted. As a result, many states pass laws imposing mandatory driver’s license suspensions for persons caught possessing cannabis, even if unrelated to driving. 2014: The Rohrabacher–Farr amendment passed the U.S. House and was signed into law. Requiring annual renewal, it prohibits the Justice Department from interfering with the implementation of state medical cannabis laws. 1931: Texas declared cannabis a “narcotic“, allowing up to life sentences for possession. 1933: North Dakota and Oklahoma ban marijuana. By this year, 29 states have criminalized cannabis. 1973: Oregon became the first state to decriminalize cannabis – reducing the penalty for up to one ounce to a $100 fine. 1973: Texas law was amended to declare possession of four ounces or less a misdemeanor. 1975: Alaska, Maine, Colorado, California, and Ohio decriminalized cannabis. 1975: Alaska‘s Supreme Court establishes that the right to privacy includes possession of small amounts of marijuana. 1977: Mississippi, New York, and North Carolina decriminalized cannabis. South Dakota also decriminalized cannabis, but the law was repealed almost immediately afterwards. 1978: Nebraska decriminalized cannabis. No other state would decriminalize until 2001. 1978: New Mexico passes the Controlled Substances Therapeutic Research Act, becoming the first state to enact legislation recognizing the medical value of marijuana. Over 30 other states would pass limited medical cannabis measures during the next few years. 1979: Virginia passed legislation allowing doctors to recommend cannabis for glaucoma or the side effects of chemotherapy. 1982: Alaska passes legislation to further decrease penalties for cannabis. 1990: Alaska re-criminalizes cannabis by voter initiative, restoring criminal penalties for possession of any amount of cannabis. 1996: California became the first state to legalize medical cannabis with the approval of Proposition 215. Arizona also passed a medical cannabis ballot measure, but it was rendered ineffective on a technicality. 1998: Oregon, Alaska, and Washington all legalized medical cannabis through ballot measure. Nevada also passed a medical cannabis initiative, but it required second approval in 2000 to become law, as per the state constitution. 1999: Maine legalized medical cannabis through ballot measure. 2000: Hawaii became the first state to legalize medical cannabis through state legislature. 2000: Nevada and Colorado legalized medical cannabis through ballot measure. 2001: Nevada decriminalized cannabis through state legislature. 2003: Maryland passed legislation establishing reduced penalties for persons using cannabis due to a medical necessity (as established at trial). 2004: Vermont legalized medical cannabis through state legislature. 2004: Montana legalized medical cannabis through ballot measure. 2006: Rhode Island legalized medical cannabis through state legislature. 2007: New Mexico legalized medical cannabis through state legislature. 2008: Michigan approved a ballot to legalize medical cannabis. Massachusetts approved a ballot measure to decriminalize cannabis. 2010: New Jersey legalized medical cannabis through state legislature. 2010: Arizona legalized medical cannabis through ballot measure. 2010: California legislators reduce penalties for cannabis to a civil infraction. 2011: Delaware legalized medical cannabis through state legislature. 2011: Connecticut decriminalized cannabis through state legislature. 2012: Connecticut legalized medical cannabis through state legislature. 2012: Rhode Island decriminalized cannabis through state legislature. 2012: Colorado and Washington become the first two states to legalize the recreational use of cannabis, following the passage of Amendment 64 and Initiative 502. Massachusetts approved a ballot measure to legalize medical cannabis. 2013: Vermont decriminalized cannabis through state legislature. 2013: New Hampshire legalized medical cannabis through state legislature. 2013: Illinois legalized medical cannabis through state legislature. 2014: Utah became the first state to pass a low-THC, high-CBD medical cannabis law. These laws allowed low-THC cannabis oil to be used for treatment of certain medical conditions with a doctor’s recommendation. 2014: Maryland legislators decriminalized cannabis and approved a comprehensive medical cannabis law, expanding the very limited measure that was passed in 2003. 2014: Missouri decriminalized cannabis through state legislature. 2014: Minnesota legalized medical cannabis through state legislature. 2014: New York legalized medical cannabis through state legislature. 2014: Alaska and Oregon legalized recreational cannabis through ballot measure. 2014: By the end of the year ten more states passed low-THC, high-CBD medical cannabis laws: Alabama, Kentucky, Wisconsin, Mississippi, Tennessee, Iowa, South Carolina, Florida, North Carolina, and Missouri. 2015: Delaware decriminalized cannabis through state legislature. 2015: Louisiana legislators passed a limited medical cannabis law. 2015: During the year, five more states passed low-THC, high-CBD medical cannabis laws: Virginia, Georgia, Oklahoma, Texas, and Wyoming. 2016: Pennsylvania legalized medical cannabis through state legislature. 2016: Ohio legalized medical cannabis through state legislature. 2016: Illinois decriminalized cannabis through state legislature. 2016: California, Nevada, Maine, and Massachusetts approved ballot measures to legalize recreational cannabis. Arkansas, Florida, and North Dakota approved ballot measures to legalize medical cannabis. 2017: West Virginia legalized medical cannabis through state legislature. 2017: Indiana passed a low-THC, high-CBD medical cannabis law. 2017: New Hampshire decriminalized cannabis through state legislature. 2018: Vermont became the first state to legalize recreational cannabis by way of state legislature. 2018: Indiana legalized CBD for any use. 2018: Kansas legalized CBD for any use. 2018: Oklahoma legalized medical cannabis through ballot measure. 2018: Michigan approved a ballot measure to legalize recreational cannabis. Missouri and Utah approved ballot measures to legalize medical cannabis. 2019: New Mexico decriminalized cannabis through state legislature. 1906: Washington, D.C. requires a prescription for cannabis drugs. 1915: El Paso, Texas restricts cannabis. 1972: Ann Arbor City Council decriminalized cannabis, reducing the penalty to a $5 fine. The law was overturned by a Republican-led council a year later, but reinstated through voter referendum in 1974. 1977: Madison, Wisconsin decriminalized cannabis through ballot initiative. 1978: San Francisco residents approved Proposition W, a non-binding measure directing city law enforcement to “cease the arrest and prosecution of individuals involved in the cultivation, transfer, or possession of marijuana”. Mayor George Moscone was assassinated shortly afterwards, however, and the initiative was disregarded by new mayor Dianne Feinstein. 1991: San Francisco residents approved the non-binding Proposition P in support of the medical use of cannabis. The city Board of Supervisors followed with Resolution 141-92 in 1992, which allowed for the distribution of medical cannabis throughout the city. 1998: Washington, D.C. residents approved Initiative 59 to legalize medical cannabis, but the Barr amendment blocked implementation until 2009, with the first legal sales finally occurring in 2013. 2003: Seattle residents voted to make enforcement of cannabis laws the lowest priority. 2004: Oakland, California residents approved Measure Z, making private adult cannabis offenses the lowest possible priority for law enforcement, establishing a system to regulate, tax, and sell cannabis pending state legalization, and urging legalization on the state and national levels. 2005: Denver residents voted to legalize cannabis. 2006: San Francisco made enforcement of cannabis laws the lowest priority. The change was approved through a Board of Supervisors vote. 2009: Breckenridge, Colorado residents voted to legalize cannabis. 2012: Chicago decriminalized cannabis through a City Council vote. 2012: Detroit, Grand Rapids, and Flint residents voted to decriminalize cannabis. 2013: Portland, Maine residents voted to legalize cannabis. 2014: Philadelphia decriminalized cannabis through a City Council vote. 2014: After a City Council vote decriminalized cannabis in March, Washington D.C. residents voted in November to legalize recreational use of cannabis and personal cultivation. A congressional rider passed afterwards prevented D.C. City Council from legalizing commercial sales. 2014: New York City decriminalized cannabis through a new policy announced by city officials. 2015: Wichita, Kansas decriminalized cannabis through voter referendum. 2015: Miami-Dade commissioners voted to decriminalize cannabis. 2015: Toledo, Ohio residents voted to decriminalize possession of cannabis less than 200 grams. 2015: Pittsburgh decriminalized cannabis through a City Council vote. 2016: Tampa decriminalized cannabis through a City Council vote. 2016: New Orleans decriminalized cannabis through a City Council vote. 2016: Orlando decriminalized cannabis through a City Council vote. 2016: Nashville decriminalized cannabis through a Metro Council vote. 2016: Memphis decriminalized cannabis through a City Council vote. 2016: Residents in the Ohio cities of Bellaire, Logan, Newark, and Roseville voted to decriminalize possession of cannabis less than 200 grams. 2017: Houston decriminalized cannabis through a new policy announced by the city’s district attorney. 2017: Kansas City, Missouri residents voted to decriminalize cannabis, eliminating jail time for possession of 35 grams or less and reducing the penalty to a $25 fine. 2017: Atlanta decriminalized possession of one ounce or less of cannabis via unanimous City Council vote. 2018: Albuquerque decriminalized cannabis through a City Council vote. 2014: Guam legalized medical cannabis through ballot measure. 2014: The U.S. Virgin Islands decriminalized cannabis. 2015: Puerto Rico legalized medical cannabis by executive order. 2018: The Northern Mariana Islands legalized recreational cannabis through an act of legislature. 2019: The U.S. Virgin Islands legalized medical cannabis through an act of legislature. 2019: Guam legalized recreational cannabis through an act of legislature. 2014: The U.S. Justice Department announced a policy to allow recognized Indian tribes to legalize cannabis on their lands. The laws on reservations are allowed to be different from state and federal laws, and as with states that have legalized cannabis the federal government will not intervene as long as strict controls are maintained. Some domestic nations such as the Yakama Nation and the Oglala Sioux Tribal Council rejected legalization on their reservations. 2015: The Flandreau Santee Sioux Tribe (South Dakota) voted to legalize recreational cannabis on its reservation. 2015: The Squaxin Island Tribe in the Puget Sound area legalized and opened the United States’ first tribal retail cannabis sales shop on their trust lands. Suquamish Tribe followed later in the same year. 2015: The Pinoleville Pomo Nation in California announced a plan to grow cannabis and sell it to California medical dispensaries. 2016: The Puyallup Tribe made legal arrangements with the State of Washington to grow its own medical cannabis. 1977: Jimmy Carter became the first sitting president to endorse cannabis decriminalization. 2015: President Barack Obama declared his support of cannabis decriminalization but opposition to legalization. 1969: Gallup conducted its first poll on legalizing cannabis, finding 12% in favor. 1973: General Social Survey‘s first poll on legalizing cannabis showed 19% in favor. 1977: Gallup reported 28% support for the legalization of cannabis, a number that would not be surpassed until 2000. 2011: Gallup reported 50% support for legalizing cannabis. 2013: Pew Research reported 52%  and Gallup 58% in support of legalizing cannabis. In both polls, a majority of respondents supported legalization for the first time. 2017: Gallup’s annual poll showed 64% support for the legalization of cannabis, including a majority of Republicans for the first time. 2018: Reflecting the increased growth of support for marijuana legalization, Gallup’s annual poll showed that 66% of Americans supported legalization, including 75% of Democrats, 71% of Independents, 59% of people over 55, and at least 65% support in the East, South, Midwest, and West. ^ a b Pacula, Rosalie Piccardo (February 2002). “State Medical Marijuana Laws: Understanding the Laws and Their Limitations” (PDF). Journal of Public Health Policy. 23 (4): 413–439. CiteSeerX 10.1.1.202.2274. doi:10.2307/3343240. JSTOR 3343240. ^ Reilly, Ryan (May 30, 2014). “House Blocks DEA From Targeting Medical Marijuana”. Huffington Post. Retrieved July 4, 2014. ^ Sullum, Jacob (January 4, 2016). “The Federal Ban on Medical Marijuana Was Not Lifted”. Reason. Retrieved January 22, 2017. ^ a b c d e Sarah E. Boslaugh (8 December 2015). The SAGE Encyclopedia of Pharmacology and Society. SAGE Publications. pp. 1758–. ISBN 978-1-5063-4618-2. ^ a b Richard Davenport-Hines (29 November 2012). The Pursuit of Oblivion: A Social History of Drugs. Orion Publishing Group. pp. 126–. ISBN 978-1-78022-542-5. ^ Beatriz Caiuby Labate; Clancy Cavnar (25 March 2014). Prohibition, Religious Freedom, and Human Rights: Regulating Traditional Drug Use. Springer Science & Business Media. pp. 236–. ISBN 978-3-642-40957-8. ^ a b c d e Anderson, Patrick (February 27, 1981). High In America: The True Story Behind NORML And The Politics Of Marijuana. The Viking Press. ISBN 978-0670119905. ^ “State by State Laws: Alaska”. National Organization for the Reform of Marijuana Laws. 2006. Retrieved December 24, 2006. ^ David R. Bewley-Taylor (22 March 2012). International Drug Control: Consensus Fractured. Cambridge University Press. pp. 169–. ISBN 978-1-107-37907-7. ^ Lester Grinspoon; James B. Bakalar (1997). Marihuana, the Forbidden Medicine. Yale University Press. pp. 18–. ISBN 978-0-300-07086-6. ^ James A. Inciardi; Lana D. Harrison (11 October 1999). Harm Reduction: National and International Perspectives. SAGE. pp. 84–. ISBN 978-0-7619-0688-9. ^ San Francisco Chronicle (1997-02-02). “Va. finds it legalized medical marijuana Law passed in 1979 with no controversy”. Articles.baltimoresun.com. Retrieved 2017-01-12. ^ Matthew Lippman (22 August 2013). Essential Criminal Law. SAGE Publications. pp. 298–. ISBN 978-1-4833-2447-0. ^ Michael D. Lyman (25 September 2013). Drugs in Society: Causes, Concepts, and Control. Routledge. pp. 398–. ISBN 978-0-12-407167-4. ^ a b c “Active State Medical Marijuana Programs – NORML”. norml.com. Archived from the original on May 3, 2008. Retrieved June 4, 2008. ^ “Medical Marijuana Initiatives Pass In Colorado and Nevada; Californians Pass Initiative To Keep Non-Violent Drug Offenders Out Of Jail”. NORML. November 9, 2000. Retrieved February 9, 2018. ^ Whitlock, Craig; Montgomery, Lori (May 23, 2003). “Ehrlich Signs Marijuana Bill”. The Washington Post. Retrieved February 9, 2018. ^ “Vermont Approves Amended Medical Marijuana Measure”. NORML. May 20, 2004. Retrieved February 9, 2018. ^ “Rhode Island Legalizes Medical Marijuana”. Fox News. Associated Press. January 3, 2006. Retrieved February 9, 2018. ^ “New Mexico approves medical use of marijuana”. Reuters. April 2, 2007. Retrieved February 9, 2018. ^ Kocieniewski, David (January 12, 2010). “New Jersey Lawmakers Pass Medical Marijuana Bill”. nytimes.com. Retrieved January 11, 2010. ^ McGreevy, Patrick (October 2, 2010). “Schwarzenegger approves bill downgrading marijuana possession of ounce or less to an infraction”. Los Angeles Times. Retrieved February 9, 2018. ^ “Delaware Passes Medical Marijuana Law”. Marijuana Policy Project. May 13, 2011. Retrieved February 9, 2018. ^ “Conn. passes bill to decriminalize marijuana”. CBS News. Associated Press. June 8, 2011. Retrieved January 19, 2018. ^ Graves, Lucia (June 1, 2012). “Medical Marijuana States Add Number 17, Connecticut”. HuffPost. Retrieved February 9, 2018. ^ Coffman, Keith; Neroulias, Nicole (November 6, 2012). “Colorado, Washington first states to legalize recreational pot”. Reuters. Retrieved February 9, 2018. ^ Wing, Nick (July 23, 2013). “New Hampshire Medical Marijuana Bill Signed Into Law”. HuffPost. Retrieved February 9, 2018. ^ “Governor Pat Quinn signs bill making medical marijuana legal in Illinois”. ABC 7 Chicago. August 1, 2013. Retrieved February 9, 2018. ^ “First-of-its-kind medical marijuana law signed in Utah”. RT. March 26, 2014. Retrieved February 10, 2018. ^ “Maryland: Marijuana Law Reform Measures Signed Into Law”. NORML. April 17, 2014. Retrieved February 9, 2018. ^ Condon, Patrick (May 29, 2014). “Dayton signs medical marijuana bill”. Star Tribune. Retrieved February 9, 2018. ^ Campbell, Jon (July 7, 2014). “Cuomo signs New York’s medical marijuana bill”. USA Today. Retrieved February 9, 2018. 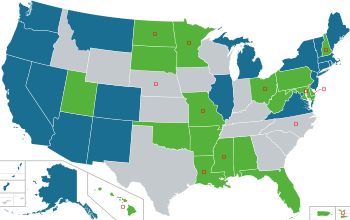 ^ a b “18 States with Laws Specifically about Legal Cannabidiol (CBD)”. ProCon.org. Retrieved February 10, 2018. ^ Litten, Kevin (June 29, 2015). “Bobby Jindal signs marijuana bills that reform criminal penalties, medical marijuana access”. The Times-Picayune. Retrieved February 3, 2017. ^ “State Medical Marijuana Laws”. National Conference of State Legislatures. Retrieved February 9, 2018. ^ Langley, Karen (April 18, 2016). “Medical marijuana legalized in Pennsylvania”. Pittsburgh Post-Gazette. Retrieved February 9, 2018. ^ Borchardt, Jackie (June 8, 2016). “Gov. John Kasich signs medical marijuana bill into law”. cleveland.com. Retrieved February 9, 2018. ^ Zuckerman, Jake (April 19, 2017). “WV governor signs medical marijuana into law”. Charleston Gazette-Mail. Retrieved February 9, 2018. ^ Sheridan, Jill (April 27, 2017). “Governor Signs Indiana’s First Medicinal Cannabis Bill”. WBOI. Retrieved February 10, 2018. ^ Wilson, Reid (January 22, 2018). “Vermont governor signs marijuana legalization bill”. The Hill. Retrieved February 9, 2018. ^ Moore, Chris (March 22, 2018). “Indiana Legalizes Medical CBD Oil, Again”. Merry Jane. Retrieved November 15, 2018. ^ Marso, Andy (June 6, 2018). “Cannabis extract CBD now legal in Kansas — with one big caveat”. The Kansas City Star. Retrieved November 15, 2018. ^ Bowden, John (June 26, 2018). “Oklahoma votes to legalize medicinal marijuana”. The Hill. Retrieved June 27, 2018. ^ Gray, Kathleen (November 6, 2018). “Proposal 1: Marijuana legalization passes in Michigan”. Detroit Free Press. Retrieved November 7, 2018. ^ Angell, Tom (April 4, 2019). “New Mexico Governor Signs Marijuana Decriminalization Bill”. Forbes. Retrieved April 4, 2019. ^ United States. Congress. Senate. Committee on the Judiciary. Subcommittee to Investigate Juvenile Delinquency (1977). Marijuana decriminalization: hearing before the Subcommittee to Investigate Juvenile Delinquency of the Committee on the Judiciary, United States Senate, Ninety-fourth Congress, first session, pursuant to S. Res. 72, section 12, Investigation of juvenile delinquency in the United States, S. 1450 … May 14, 1975. U.S. Government Printing Office. p. 286. ^ Aaron Martinez (2015-06-02). “100 years after El Paso becomes first city in U.S. to outlaw pot, debate remains the same”. Elpasotimes.com. Retrieved 2016-10-27. ^ “Ann Arbor Defies New Marijuana Law”. The New York Times. July 15, 1973. Retrieved February 24, 2018. ^ “Ann Arbor Votes $5 Fine For the Use of Marijuana”. The New York Times. April 3, 1074. Retrieved February 24, 2018. ^ Heddleston, Thomas R. (June 2012). From the Frontlines to the Bottom Line: Medical Marijuana, the War on Drugs, and the Drug Policy Reform Movement (Thesis). UC Santa Cruz Electronic Theses and Dissertations. Archived from the original on February 16, 2014. ^ “Proposition P”. marijuanalibrary.org. Retrieved February 8, 2018. ^ Gardner, Fred (August 26, 2014). “The Cannabis Buyers Club: How Medical Marijuana Began in California”. marijuana.com. Retrieved February 8, 2018. ^ Altieri, Erik (2013-07-30). “First Medical Marijuana Sale Reported in Washington, DC | NORML Blog, Marijuana Law Reform”. Blog.norml.org. Retrieved 2016-11-20. ^ “Seattle Voters Approve Initiative Making Marijuana Enforcement City’s “Lowest Priority““. NORML. September 18, 2003. Retrieved February 7, 2018. ^ “Measure Z Home Page”. Oaksterdam Cannabis Museum. Retrieved October 13, 2015. ^ “Denver votes to legalize marijuana possession”. USA Today. November 3, 2005. Retrieved October 16, 2014. ^ “San Francisco Board of Supervisors Vote Overwhelmingly to Deprioritize Adult Marijuana Offenses; Now Officially Lowest Law Enforcement Priority”. Drug Policy Alliance. November 14, 2006. Retrieved February 7, 2018. ^ “Breckenridge Pot Legalization Creates Big Buzz”. ABC 7 Denver. November 5, 2009. Retrieved October 1, 2014. ^ Mack, Kristen (June 27, 2012). “Chicago City Council passes pot ticket ordinance”. Chicago Tribune. Retrieved February 7, 2018. ^ “Marijuana decriminalized in five Mich. cities, but police still plan to make arrests”. CBS News. November 8, 2012. Retrieved February 7, 2018. ^ Wilkey, Robin (2013-11-06). “Portland, Maine, Legalizes Recreational Marijuana”. Huffington Post. Retrieved October 1, 2014. ^ “Philadelphia Is Decriminalizing Marijuana Possession”. Retrieved October 1, 2014. ^ Davis, Aaron C. (March 5, 2014). “D.C. Council votes to eliminate jail time for marijuana possession”. The Washington Post. Retrieved November 15, 2018. ^ Ferner, Matt (November 4, 2014). “Washington, D.C. Votes To Legalize Recreational Marijuana”. HuffPost. Retrieved November 15, 2018. ^ Garcia, Maddie (July 30, 2017). “D.C. Marijuana Market: Stuck In A Gray Zone”. NPR. Retrieved November 15, 2018. ^ “Pot in NYC may soon net just a ticket, not an arrest”. CNN. Retrieved November 12, 2014. ^ Hanks, Douglas (June 30, 2015). “Miami-Dade adopts $100 fine for pot possession”. Miami Herald. Retrieved February 7, 2018. ^ a b Janice Williams (2016-11-14). “Marijuana Legalization In Ohio: Several Cities Vote In Favor Of Decriminalization Laws”. Ibtimes.com. Retrieved 2016-11-30. ^ Goldstein, Chris (January 5, 2016). “Pittsburgh mayor quietly signs bill to decriminalize marijuana”. The Philadelphia Inquirer. Retrieved February 7, 2018. ^ Lanee, Jamel (March 17, 2016). “Tampa votes to decriminalize marijuana”. WFLA. Retrieved February 7, 2018. ^ LaRose, Greg (March 17, 2016). “No arrests for pot possession in New Orleans, council decides”. The Times-Picayune. Retrieved February 7, 2018. ^ Weiner, Jeff (May 9, 2016). “Orlando OKs citations for marijuana possession in small amounts”. Orlando Sentinel. Retrieved February 7, 2018. ^ Garrison, Joey (September 20, 2016). “Nashville passes marijuana decriminalization measure”. The Tennessean. Retrieved February 7, 2018. ^ Poe, Ryan (October 4, 2016). “Memphis council OKs decriminalizing pot in some cases”. The Commercial Appeal. Retrieved February 7, 2018. ^ Rogers, Brian (February 16, 2017). “New policy to decriminalize marijuana in Harris County will save time, money, DA’s office says”. Houston Chronicle. Retrieved February 7, 2018. ^ Cummings, Ian (April 4, 2017). “KC voters approve lower penalty for pot possession: $25 fine and no jail”. The Kansas City Star. Retrieved February 11, 2018. ^ Stafford, Leon (October 2, 2017). “Atlanta City Council cuts penalties, jail time for some pot possession”. The Atlanta Journal-Constitution. Retrieved February 11, 2018. ^ Knight, Steve; Reisen, Matthew (April 12, 2018). “Mayor signs new pot bill into law”. Albuquerque Journal. Retrieved May 12, 2018. ^ “Guam Legalizes Medical Marijuana”. The Huffington Post. Retrieved January 11, 2015. ^ Alexandra Sifferlin. “Puerto Rico Governor Signs Executive Order to Legalize Medical Pot”. TIME.com. Retrieved 28 September 2015. ^ Angell, Tom (September 21, 2018). “Governor Signs Marijuana Legalization Bill, Making History In US Territory”. Forbes. Retrieved September 21, 2018. ^ “Guam Legalizes Marijuana Use By Adults”. NORML. April 4, 2019. Retrieved April 4, 2019. ^ “Pinoleville Pomo Nation confirms deal for legal marijuana farm”. January 9, 2015. ^ Walsh, Edward (August 3, 1977). “Carter Endorses Decriminalization Of Marijuana”. The Washington Post. Retrieved February 10, 2018. ^ Lopez, German. “President Obama wants to treat marijuana like tobacco but not legalize it. Wait, what?”. Vox. Retrieved February 27, 2015. ^ Wheaton, Sarah (March 16, 2015). “Obama snuffs stoner dreams of legalization”. Politico. Retrieved March 16, 2015. ^ a b “Illegal Drugs”. Gallup. Retrieved February 10, 2018. ^ “Should marijuana be made legal”. GSS Data Explorer. Retrieved February 10, 2018. ^ Newport, Frank (October 17, 2011). “Record-High 50% of Americans Favor Legalizing Marijuana Use”. Gallup. Retrieved February 10, 2018. ^ “Majority Now Supports Legalizing Marijuana”. Pew Research Center. April 4, 2013. Retrieved February 10, 2018. ^ Swift, Art (October 22, 2013). “For First Time, Americans Favor Legalizing Marijuana”. Gallup. Retrieved February 10, 2018. ^ McCarthy, Justin (October 25, 2017). “Record-High Support for Legalizing Marijuana Use in U.S.” Gallup. Retrieved February 10, 2018. ^ McCarthy, Justin (October 22, 2018). “Two in Three Americans Now Support Legalizing Marijuana”. Gallup. Retrieved October 30, 2018.